To Cite: De Martinis M, Sirufo M M, Ginaldi L. A “Stadium” Urticaria, Cold Urticaria Is Still a Mostly Unknown Disease, with a Wide Spectrum of Severity Degrees and Few Therapeutic Certainties: Is Omalizumab One of These? Reflections from a Clinical Case Report, Iran Red Crescent Med J. 2019 ; 21(1):e84250. doi: 10.5812/ircmj.84250. Introduction: One of the most common forms of physical urticaria is the cold urticaria. It can be a medical emergency, since it can induce anaphylaxis and edema of the glottis, and in any case, it is a condition that reduces the quality of life of the affected subjects forced to significantly limit their normal activities. Moreover, since the symptoms are triggered by exposure to cold, which is difficult (if not impossible) to avoid in everyday life, a safe and effective therapy appears to be essential. Unfortunately, traditional therapies often cannot provide adequate and safe answers. Case Presentation: The current study reported the case of a 52-year-old female patient manifesting the first symptoms after going to the stadium to watch football games while sitting in the stands. On such occasions, her buttocks would begin to itch, and started swelling and reddening. These manifestations then occurred on other occasions of exposure to the cold, and in other body areas. The patient visited the outpatient clinic of Allergy and Clinical Immunology Unit, Teramo General Hospital (Teramo, Italy), and was treated with sedating and non-sedating H1-blocking antihistamines (Rupatadine, Cetirizine), a leukotriene antagonist, and oral steroids with no success; therefore, it was decided to treat her with Omalizumab, an anti-IgE antibody. Conclusions: The satisfactory response to Omalizumab in the patient, after the failure of previous standard therapeutic strategies, confirmed the effectiveness of this molecule to treat cold urticaria, which despite what reported in several studies, is not yet recognized and authorized by the competent health authorities in the treatment of this condition. Cold urticaria (CU) is one of the most common forms of physical urticaria, accounting for one-third of all cases (1). It is a serious form of chronic inducible urticaria, with higher rates of incidence in colder climates and females, and with the most common onset observed in young adults. Symptoms are triggered by exposure to objects, water, and air at temperatures lower than the body. Wheals and/or angioedema manifest within minutes and persist for up to two hours after the contact with the cold site/object. Up to one-third of people could experience systemic symptoms such as fatigue, headache, or generalized urticaria, up to anaphylaxis. Swimming in cold water- or the full immersion of the body in cold water/an extensive contact with cold-could induce dangerous systemic reactions/anaphylaxis. Similar risks could be the consequence of surgical procedures or the infusion of cold intravenous solutions. Despite the severity of the possible clinical pictures, cold urticaria is still understudied, and the authors’ knowledge about the condition, its natural history, and the factors that determine the prognosis and help to make therapeutic decisions is limited. From the clinical point of view, cold urticaria is classified into three types, in two possible classification attempts, as shown in Tables 1 and 2 (2, 3). The condition through sensory nerve activation, vasodilatation, plasma extravasation, and cell recruitment is due to mast cell degranulation, and the subsequent release of platelet-activating factor (PAF), pro-inflammatory cytokines, and histamine. Mast cell-activating signals are heterogeneous and diverse, probably specific to each type of urticaria. Although the precise pathogenetic mechanism underlying cold urticaria is still mostly unknown, IgE seems to play a relevant role, at least in some cases. Few studies and some case reports are available, reporting the effectiveness of treatments in cold urticaria as a specific entity. Considering the possible severity of symptoms and the difficulty-if not impossibility-of avoiding cold in everyday life, it is easy to understand the need for an effective cure. The treatment of cold urticaria aimed at the complete control of the symptoms and the triggering of the disease still involves a step-by-step approach. In many patients, antihistamine therapy is inadequate to control the development of symptoms of cold urticaria, even with higher than the standard doses. More specifically, second-generation antihistamines were better than placebo to treat Cold urticaria; besides, up-dosing to four times the standard dosage may be effective. On the other hand, other treatments such as Cyproheptadine and Doxepin did not provide the same evidence (4). In the literature, cases treated with con Anakinra (human interleukin (IL)-1 receptor antagonist (r-metHuIL-1ra) (5), Etanercept (human tumor necrosis factor receptor (p75) Fc fusion protein) (6), and Reslizumab (humanized monoclonal anti-IL-5) were also described (7). The current management of the disease is often unsatisfactory, and unable to induce the resolution of the symptoms, or at least a significant clinical improvement with the achievement of adequate patient safety; it is, therefore, necessary to find a new effective and safe therapeutic strategy. Currently, Omalizumab- a recombinant humanized immunoglobulin (Ig) G1 monoclonal antibody- is approved to treat chronic urticaria and asthma, and is now used off-label in several conditions to evaluate its effectiveness and safety in the management of other conditions (8). Omalizumab binds to IgE and prevents the binding of the latter to FcεRI (high-affinity IgE receptor), thereby reducing the amount of free IgE that is available to trigger the allergic cascade, preventing their binding to the specific receptor on mast cells and other effector cells. The treatment of atopic subjects with Omalizumab resulted in a marked down-regulation of FcεRI receptors on basophils (9). Omalizumab is effective in many cases of cold urticaria (Table 3) (1, 8, 10). The current study patient provided written informed consent for the publication of this report and any associated images. The current study reported the case of a 52-year-old female patient with cold urticaria for one year treated with sedating and non-sedating H1-blocking antihistamines (Rupatadine, Cetirizine), a leukotriene antagonist, and oral steroids, without success. The patient, a football fan, began to complain of the first disorders over a year ago; she could not understand why, shortly after arriving at the stadium to watch a game, her buttocks would begin to feel itchy, while reddening and swelling. Upon returning home, her symptoms quickly regressed. Afterward, the same disorders began to affect her hands, after taking cold objects, her arms, while resting on a marble sill, and her face, after the exposure to cold winter air. Urticaria only affected the body areas in contact with the cold. The patient visited the outpatient clinic of Allergy and Clinical Immunology Unit, Teramo General Hospital, Teramo, Italy, on February 2016, to complain about these disorders that appeared suddenly and mysteriously, and regressed in a variable and equally mysterious way. The condition-despite her passion for football-made her desist from going to the stadium to watch the game of her team. However, she still could not make a direct connection with the exposure to cold. She had no significant co-morbidities and did not take any drugs, no atopic family members, and nobody with similar disorders. The assessment of her cold urticaria showed an uncontrolled disease before the treatment with urticaria control test (UTC) (Table 3). The patient was advised not to expose herself to strong temperature variations, stay in cold environments for a long time, bath in cold water, and have contact with cold objects or food. The Cold Urticaria diagnosis was based on the criteria of the EAACI/GA2LEN/EDF/WAO guidelines (2017 revision and update) to define, classify, diagnose, and manage urticaria (11). 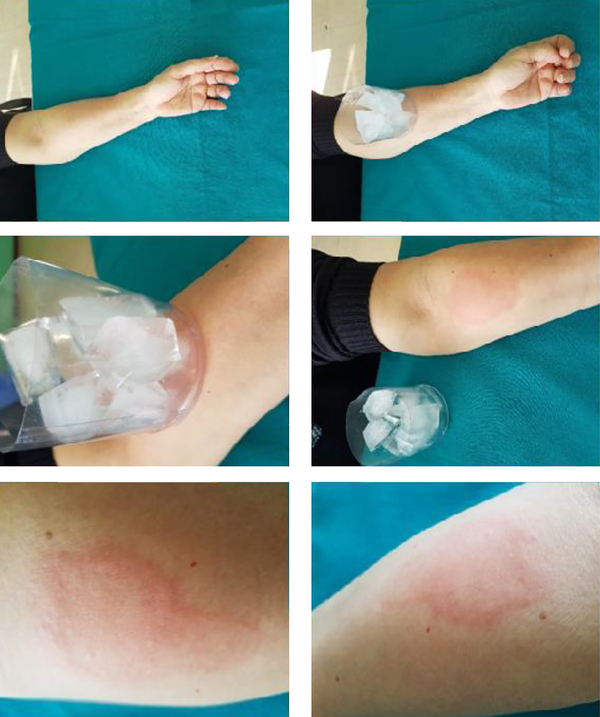 The ice cube provocation test revealed positive results within less than five minutes (Figure 1), with the development of itch, wheals, and redness. Figure 1. A cold stimulus is placed on the forearm of the patient for five minutes. The manifestation of an immediate coalescent wheal is indicative of cold urticarial. Autologous serum skin test, erythrocyte sedimentation rate, complete blood count, standard biochemical profile, serum protein electrophoresis, C-reactive protein, total IgE levels, anti-neutrophil antibody, rheumatoid factor, complement 3 and 4, C1 esterase inhibitor, anti-double-stranded DNA, anti-extractable nuclear antigens, anti-thyroglobulin/anti-thyroid peroxidase antibodies, most common viral, bacterial, and parasite infections, cryoglobulins, and research for factor XII mutations were all within the normal ranges (12). After receiving the patient’s informed consent, in compliance with the rules of the institution, Omalizumab was administered off-label (300 mg via subcutaneous injection per month, for six months) at room temperature. The dose of Omalizumab administered to the patient was the same recommended in the treatment of chronic spontaneous urticaria. Rupatadine was gradually reduced and discontinued in the second month of Omalizumab therapy. No side effects were observed at the injection site. The patient reported a significant improvement after the second injection, and she was free of symptoms three months later. She started going to the stadium once again. Repeated ice cube provocation test produced negative findings. At a six-month follow-up, symptoms remained controlled without any further treatment. The assessment of the cold urticaria is reported in Table 4. Although cold urticaria is among the most common forms of physical urticaria, its pathophysiology is still largely unknown, despite the likely significant role played by the mast cells activated by Immunoglobulin E (1, 8). The activation and degranulation of the mast cells lead to the formation of wheals and angioedema. Histamine and other liberated mediators induce vasodilatation and increased permeability, with a consequent edema of the superficial, and/or deep dermis and the subcutis. In patients with chronic urticaria, the degranulation of cutaneous mast cells would seem to involve autoimmune mechanisms, of which two types are identified. In the first type, degranulation takes place due to the binding of IgE autoantibodies to the high-affinity receptor of the mast cells and occurs after the cross-linking of the autoallergens; for example, the Anti-thyroperoxidase and Anti-IL-24 (13, 14). In the second type, mast cell degranulation is induced by IgG autoantibodies directed against the high-affinity IgE receptor. On mast cell degranulation in cold urticaria however, even less is known, but in this case the involvement of autoimmune mechanisms is also hypothesized (1). It is certain that, also in this case, a key role is played by the activated mast cells and the consequent release of inflammatory mediators such as histamine. Mast cell degranulation is modulated by many different signals among which the most important ones are neuropeptides, complementary factors, factors associated with pathogens, as well as drugs and food in intolerant subjects. The causes of the mast cell activation and degranulation in the chronic inducible urticaria (CindU) are still uncertain: one of the most accredited hypotheses is once again that of an autoimmune- or, more specifically, autoallergic-mechanism. Some forms of CindU including the cold one are transferable, and it is assumed that the transferable serum factor is represented by IgE. It is shown that desensitization (that in some cases of cold urticaria is effective) does not work through the depletion of mast cells or the mediators released by the latter, but through a reduction of the activation signal of the mast cells. Although little is known about the actual pathogenic mechanisms of cold urticaria, it is hypothesized that either specific IgE antibodies react against skin antigens (auto-antigens) that would reveal upon a decrease in temperature; or, in the same conditions, circulating IgG (or IgM) auto-antibodies would bind to IgE or to its specific FcεRI on the cutaneous mast cells inducing the release of histamine and other inflammation mediators. After exposure to cold, in the mast cells of the patients signs of degranulation are observed, and there is an increase in the serum levels of histamine and other mediators such as tumor necrosis factor (TNF)-α and prostaglandin D2 (PGD2), a chemotactic factor for neutrophils, and the activation factor of lipid-like platelets (PAF-like lipid). In some patients, the association with hematological disorders and cryoglobulinemia is described, and a relationship with bacterial, viral, and parasitic infections is observed, while in some individuals the onset of cold urticaria appeared to be resulting from the use of drugs (Oral Contraceptives, Griseofulvin, ACE-inhibitors, Alprazolam), or from insect or jellyfish bites. Cases occurring after the exposure to a vaccine are also described (15). These apparently secondary forms, however, are extremely rare compared with the total of the cases observed. According to the numerous possible cold stimuli capable of triggering this type of urticaria, a careful anamnesis is the foundation for a correct diagnosis confirmed by the provocation test, as suggested by the guidelines published by EAACI/GA2LEN/EDF/WAO (11). Cold urticaria may be a medical emergency, due to the risk of anaphylaxis and oropharyngeal edema. All the cases highlight the need for an adequate knowledge of the underlying pathogenetic mechanisms and, above all, for an effective and safe therapy that improves the quality of life of patients and protects them from the serious risks they might incur. Omalizumab is a widely used therapeutic anti-IgE antibody currently indicated to treat moderate to severe persistent asthma and chronic idiopathic urticaria. It demonstrated robust clinical efficacy, and seems to be promising in a wide range of other allergic diseases. Although it is not yet clear how Omalizumab specifically acts in the various diseases in which it is proven effective, its primarily action is to neutralize free serum IgE; therefore, it also reduces the surface levels of IgE on FcεRI-expressing cells, including mast cells and basophils. As IgE surface levels decline on these allergic effector cells, they lose the ability to bind allergen and undergo IgE-dependent activation, and the allergic cascade is interrupted. The suppression of these cells leads to a reduction of the pro-inflammatory cytokine levels and dendritic cells, lymphocytes, and eosinophils in tissue, and eventually a decrease in the inflammatory state of the whole immune system. In chronic idiopathic/spontaneous urticaria, several possible mechanisms of action by Omalizumab are assumed (Box 1) that are probably equally effective in cold urticaria (16). Unfortunately, traditional therapies are often unable to provide adequate and safe responses in this disease, which may become a medical emergency due to the risk of anaphylaxis and oropharyngeal edema, and in any case reduces the quality of life of the affected individuals that are forced to significantly limit their normal activities (17-19). Since the symptoms are triggered by the exposure to cold, which is difficult, if not altogether impossible, to avoid in everyday life, a safe and effective therapy appears to be essential. The satisfactory response to Omalizumab in the current study patient, after the failure of previous standard therapeutic strategies, confirmed the effectiveness of this molecule to treat cold urticaria, which despite what reported in several studies, is not yet recognized and authorized by the competent health authorities to treat this condition. A strength of the current study was certainly the confirmation of the effectiveness of Omalizumab to treat cold urticaria already highlighted in other studies that represent a great opportunity for patients, and its weak point was that it was a simple case report and controlled clinical trials on a large series of cases are needed to better define the therapeutic potential of the drug. Based on the authors’ experience, and on what was reported in the literature, Omalizumab can be an effective and safe therapeutic alternative to treat cold urticaria. Despite the effectiveness shown by Omalizumab in many cases of physical urticaria refractory to conventional therapies, (8,19,20) a certain proportion of subjects remain that do not respond satisfactorily, and it is, therefore, necessary to study more thoroughly the mechanism of action of the drug in such conditions in order to select the patients subjected to treatment and establish with confidence the appropriate doses of the drug and the duration of the treatment. In addition to clarifying the potential of Omalizumab to treat the resistant forms of physical urticaria, these investigations also pave the way for further indispensable therapeutic pathways. The authors would like to thank T&T SAS for their assistance with the English language. Unconditional support for such assistance was provided by Novartis Farma, Italy. Conflict of Interests: Authors declared no conflicts of interest. Funding/Support: The authors would like to thank Novartis Farma, Italy who provided unconditional support for publishing expenses. Patient Consent: The patient provided a written informed consent for the publication of this report and any associated image. 1. Metz M, Schutz A, Weller K, Gorczyza M, Zimmer S, Staubach P, et al. Omalizumab is effective in cold urticaria-results of a randomized placebo-controlled trial. J Allergy Clin Immunol. 2017;140(3):864-867 e5. doi: 10.1016/j.jaci.2017.01.043. [PubMed: 28389393]. 2. Wanderer AA, Grandel KE, Wasserman SI, Farr RS. Clinical characteristics of cold-induced systemic reactions in acquired cold urticaria syndromes: Recommendations for prevention of this complication and a proposal for a diagnostic classification of cold urticaria. J Allergy Clin Immunol. 1986;78(3 Pt 1):417-23. doi: 10.1016/0091-6749(86)90027-8. [PubMed: 3760401]. 3. Hochstadter EF, Ben-Shoshan M. Cold-induced urticaria: Challenges in diagnosis and management. BMJ Case Rep. 2013;2013. doi: 10.1136/bcr-2013-010441. [PubMed: 23839613]. [PubMed Central: PMC3736478]. 4. Dressler C, Werner RN, Eisert L, Zuberbier T, Nast A, Maurer M. Chronic inducible urticaria: A systematic review of treatment options. J Allergy Clin Immunol. 2018;141(5):1726-34. doi: 10.1016/j.jaci.2018.01.031. [PubMed: 29438771]. 5. Bodar EJ, Simon A, de Visser M, van der Meer JW. Complete remission of severe idiopathic cold urticaria on interleukin-1 receptor antagonist (anakinra). Neth J Med. 2009;67(9):302-5. [PubMed: 19841487]. 6. Gualdi G, Monari P, Rossi MT, Crotti S, Calzavara-Pinton PG. Successful treatment of systemic cold contact urticaria with etanercept in a patient with psoriasis. Br J Dermatol. 2012;166(6):1373-4. doi: 10.1111/j.1365-2133.2011.10797.x. [PubMed: 22212112]. 7. Maurer M, Altrichter S, Metz M, Zuberbier T, Church MK, Bergmann KC. Benefit from reslizumab treatment in a patient with chronic spontaneous urticaria and cold urticaria. J Eur Acad Dermatol Venereol. 2018;32(3):e112-3. doi: 10.1111/jdv.14594. [PubMed: 28924988]. 8. Maurer M, Metz M, Brehler R, Hillen U, Jakob T, Mahler V, et al. Omalizumab treatment in patients with chronic inducible urticaria: A systematic review of published evidence. J Allergy Clin Immunol. 2018;141(2):638-49. doi: 10.1016/j.jaci.2017.06.032. [PubMed: 28751232]. 9. Sirufo MM, De Martinis M, Ginaldi L. Omalizumab an effective and safe alternative therapy in severe refractory atopic dermatitis: A case report. Medicine (Baltimore). 2018;97(24). e10897. doi: 10.1097/MD.0000000000010897. [PubMed: 29901580]. [PubMed Central: PMC6024249]. 10. Jain SV, Mullins RJ. Cold urticaria: A 20-year follow-up study. J Eur Acad Dermatol Venereol. 2016;30(12):2066-71. doi: 10.1111/jdv.13841. [PubMed: 27422852]. 11. Zuberbier T, Aberer W, Asero R, Abdul Latiff AH, Baker D, Ballmer-Weber B, et al. The EAACI/GA(2)LEN/EDF/WAO guideline for the definition, classification, diagnosis and management of urticaria. Allergy. 2018;73(7):1393-414. doi: 10.1111/all.13397. [PubMed: 29336054]. 12. Singleton R, Halverstam CP. Diagnosis and management of cold urticaria. Cutis. 2016;97(1):59-62. [PubMed: 26919357]. 13. Altrichter S, Peter HJ, Pisarevskaja D, Metz M, Martus P, Maurer M. IgE mediated autoallergy against thyroid peroxidase--a novel pathomechanism of chronic spontaneous urticaria? PLoS One. 2011;6(4). e14794. doi: 10.1371/journal.pone.0014794. [PubMed: 21532759]. [PubMed Central: PMC3075251]. 14. Schmetzer O, Lakin E, Topal FA, Preusse P, Freier D, Church MK, et al. IL-24 is a common and specific autoantigen of IgE in patients with chronic spontaneous urticaria. J Allergy Clin Immunol. 2018;142(3):876-82. doi: 10.1016/j.jaci.2017.10.035. [PubMed: 29208545]. 15. Raison-Peyron N, Philibert C, Bernard N, Du-Thanh A, Barbaud A, Bessis D. Cold contact urticaria following vaccination: Four cases. Acta Derm Venereol. 2016;96(6):852-3. doi: 10.2340/00015555-2358. [PubMed: 26832889]. 16. Kaplan AP, Gimenez-Arnau AM, Saini SS. Mechanisms of action that contribute to efficacy of omalizumab in chronic spontaneous urticaria. Allergy. 2017;72(4):519-33. doi: 10.1111/all.13083. [PubMed: 27861988]. [PubMed Central: PMC5915348]. 17. Agbenyefia P, Shilliam LA, Stoicea N, Roth A, Moran KR. Perioperative management of a patient with cold urticaria. Front Med (Lausanne). 2017;4:222. doi: 10.3389/fmed.2017.00222. [PubMed: 29326933]. [PubMed Central: PMC5741599]. 18. Brodska P, Schmid-Grendelmeier P. Treatment of severe cold contact urticaria with omalizumab: Case reports. Case Rep Dermatol. 2012;4(3):275-80. doi: 10.1159/000346284. [PubMed: 23341807]. [PubMed Central: PMC3551415]. 19. Kitsioulis NA, Xepapadaki P, Kostoudi S, Manousakis E, Douladiris N, Papadopoulos NG. Omalizumab in pediatric cold contact urticaria: Warm blanket for a cold bath? Pediatr Allergy Immunol. 2016;27(7):752-5. doi: 10.1111/pai.12609. [PubMed: 27341491].